Jambeaux, everyone!!! Harambe! On this episode, we add new countries for EPCOT’s World Showcase. We also take a little time to address a couple of listener emails in Guest Services. 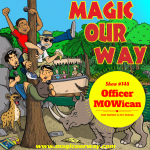 On today’s show, we present Danny, Kevin, Lee of Magical Moments Vacations and Eli of Ivory Comics. In Guest Services, we recognize the following MOWicans and address the emails they have sent in: Jon Stallings, Capt. Stan, a new listener: Sheila or ShELI as it were, and Dr. MoWHOcan. Lee also takes time out to thank listeners of the show who have also patronized his services: Nkenge, the Cokers, and Rick Suero. Recently, rumors of Spain and Brazil coming to World Showcase have been circulating the Disney-fan universe and have been ever-present in conversation as of late. We reference this article: Orlando Weekly. PLUS some honorable mentions of course.